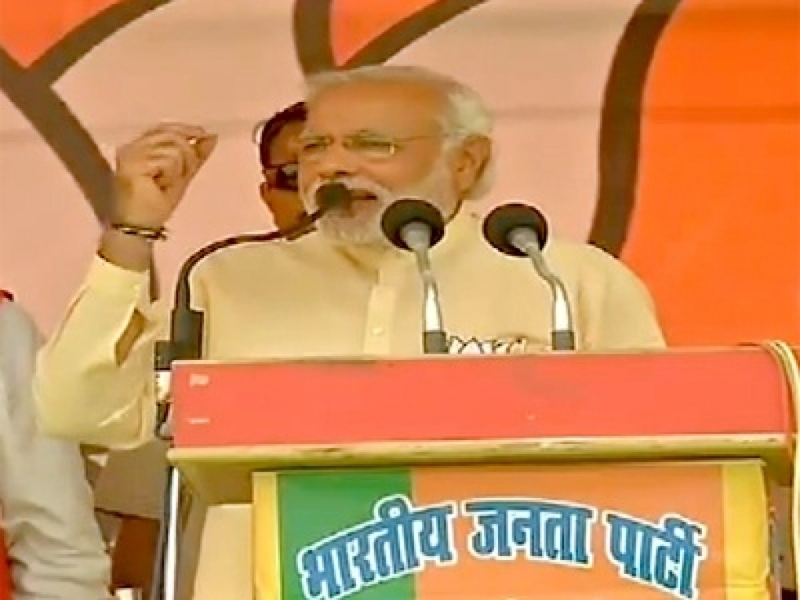 An affirmation of the BJP’s focus on empowering all sections of the society, irrespective of their class or caste, was conveyed by Shri Narendra Modi during his address at rallies in Uttar Pradesh, on 6th May, 2014. Shri Modi addressed a massive crowd of supporters at Domariyaganj, Maharajganj, Bansgaon and Salempur, and condemned the Congress’ casteist politics which looked down upon those belonging to the lower or backward sections of the society. Countering the statements by Congress leaders of Narendra Modi playing ‘neech raajneeti’, Shri Modi hit out by questioning if belonging to a backward caste was a crime. He spoke of how backward communities had been subjected to discrimination since ages, whereby the higher strata not only abused them but also snatched away every opportunity for their growth. “We are born in lower castes. Is it a crime? We sacrificed our lives for your well being too. But we never felt insulted.We do not want anything. We just want a right to live with dignity. What is the crime we have committed? Just because we belong to the lower strata, does it mean we can be abused like this? You want to hang me hang me but do not insult my fellow Indians who were born in lower castes,” said Shri Modi. Shri Modi stated how the Congress was still living with a discriminatory and abusive mentality, despite the completion of over 60 years of Independence. He also retaliated to the Congress leaders’ incessant attacks on his humble beginning, and said, “First they called me a tea seller. As if it was a crime that I sold tea. They asked if a tea seller will run the nation.” Shri Modi asserted that in a democracy, everyone, including a tea-seller, had the right to become the Prime Minister, and called on the Election Commission if it had the courage to act against such statements. Shri Modi criticized the severe lack of amenities for the people, be it in terms of providing adequate water and power supply or ensuring better sanitation facilities, and condemned the Central government’s apathy towards its people. He also spoke of how the only aim of SABKA – SP, BSP and Congress – was to defame Shri Modi and stop him from becoming the PM. He criticized their arrogance in not being answerable to people for their failure in tackling the problems of price rise, corruption, unemployment and poverty, and urged the people to wipe out the misgovernance of the Congress by voting for the BJP. Shri Modi affirmed of his vision to create ‘Ek Bharat, Shreshtha Bharat’ and develop the Nation by taking all sections of the society together. He appealed to the people to vote for the Lotus and bring in the governance for development, which focused on wiping the tears of the poor, giving employment to the youth, empowering farmers and providing basic amenities to all sections of the society. “Nation has stepped out of caste and communal politics. Youth want development and a sound future,” affirmed Shri Modi.